A major strength of the department is the high calibre of experienced and dedicated staff that makes up the imaging team. The department continues to support the four tier structure within imaging, enabling advanced radiographers to undertake activities previously undertaken by consultant radiologists, thus developing appropriate skill mix and maximising the opportunities of advanced practice across all sites. The department also has Assistant Practitioners in post, which has allowed the expansion of Advanced Practice amongst the radiographic staff, with radiographers now reporting on plain film images, CT heads and MRI musculoskeletal scans. There are also Advanced Practitioners in Interventional Radiology undertakaing central line insertions; Fluoroscopy undertaking barium swallows, HSGs and gastric band; Breast ultrasound and biopsies who is extending her scope into mammography interpretation; Ultrasound undertaking obstetrics, gynaecology and abdominal scanning as well as carotids, leg dopplars, small parts and musculoskeletal scanning. The department is led by the Clinical Service Lead, Dr Madava Djearaman; Group Manager & Lead Radiographer, Thomas Lowbridge and further supported by the Senior Leadership Team. There are currently 30 Consultant Radiologists in post across the Imaging Department. Diagnostic and Interventional Radiology Nursing offers a speciality for the future in the cutting edge field of imaging. The use of imaging to diagnose and treat patient conditions creates a unique technical environment for nurses to deliver high quality and compassionate care. 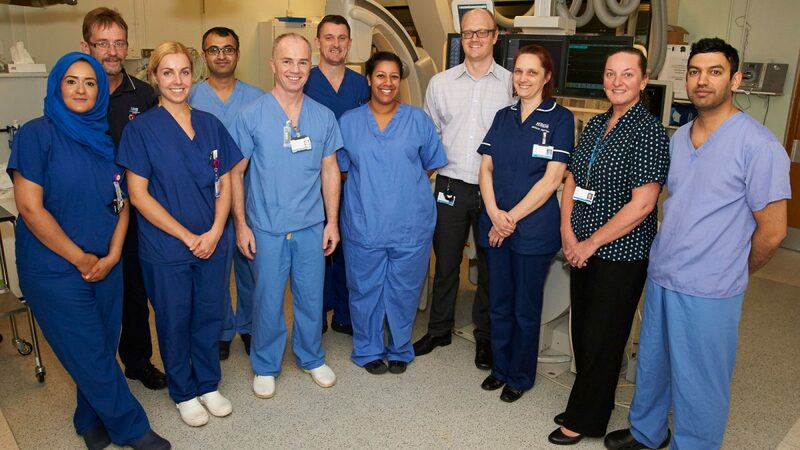 In this diverse and challenging environment our Interventional team currently consists of a Band 7 Sister, 3 Band 6 Specialist Nurses and 6 Band 5 Nurses with 1 Band 3 Support Worker. Our interdisciplinary team work in collaborative manor and are committed to a highly complex and positive environment. Interventional nursing at the Heartlands and Good Hope focuses on providing nursing care and monitoring of our patients undergoing radiological imaging and diagnostic procedures. Imaging nursing also provides patients education, assessment, intraprocedure sedation, monitoring and post procedure follow up care to patients and supporting ward areas. Nurse practitioners in Interventional Radiology are being utilised more with responsibilities including consenting of patients, communicating with clinicians, pre-assessment and vascular access service. All radiographers who practice must be registered with the Health & Care Professions Council and must abide by the HCPC Standards of conduct, performance and ethics. All radiographers must also abide by the Society and College of Radiographer Code of Conduct and Ethics regardless of whether they are a full member or not.